Former GOP presidential candidate Fred Karger on Friday announced a boycott against the Orlando Magic and Amway over a donation given by the president of the companies in support of the National Organization for Marriage (NOM), the nation's most vociferous opponent of gay marriage. At a press conference in Las Vegas to announce the boycott, Karger said that Doug DeVos gave $500,000 to the National Organization for Marriage Education Fund through his Douglas & Maria DeVos Foundation. It is the “largest family donation to NOM in its history,” Karger said. “With four crucial gay marriage elections coming up on November 6 we feel that an Amway boycott will send a message to Amway owners and other potential mega-donors that if you plan to give lots of money to anti-LGBT organizations like NOM or directly to the November anti-gay marriage campaigns we may well take action against you,” Karger said in a statement. 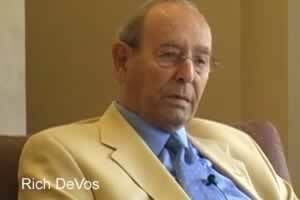 In an interview with the Grand Rapids Press, Rich DeVos, Doug DeVos' father, said that he opposes gay marriage because marriage is not vital to gay and lesbian couples and suggested that gay men were responsible for the AIDS pandemic. After buttoning up his campaign for the GOP nomination for president in June, Karger returned to gay activism, renaming advocacy group Californians Against Hate to Rights Equal Rights. The Amway/Orlando Magic boycott is the group's first since relaunching. Karger promised he was just getting started.